PHOENIX (AP) When Anthony Davis and DeMarcus Cousins are rolling and their teammates’ shots are falling, it’s a good night for the New Orleans Pelicans. Mix in a lack of effort by an opponent, and Friday night was a very good night for New Orleans. Davis had 23 points and nine rebounds, Cousins added 19 points and 10 boards and the Pelicans routed the Phoenix Suns 115-91. Davis and Cousins sat out the fourth quarter, watching from the bench long after the outcome had been decided in the Pelicans’ most one-sided victory of the season. New Orleans, coming off consecutive home victories over Oklahoma City and San Antonio, won its third straight with ease. Phoenix never mounted any threat after the opening minutes. The Pelicans led by a dozen after one quarter and 30 at the half. Jrue Holliday scored 18 points for the Pelicans, whose 72 points in the first two quarters was their highest-scoring half of the season. T.J. Warren had 18 points, and Tyler Ulis 17 for Phoenix. New Orleans was up 72-42 at the break, shooting 58 percent against the listless Suns, who ended a stretch of nine of 10 games at home. Davis and Cousins scored 15 apiece in the first half. The Pelicans made 9 of 14 3s in the first half, led by Darius Miller’s 3 of 5. By contrast, Phoenix was 2 of 13 from 3-point range in the first half and wound up 2 of 20. Devin Booker made just 4 of 13 shots for Phoenix, missed all five of his 3-point tries, and scored 13. Suns interim coach Jay Triano said the team’s first-half woes were a combination of poor shooting and bad defense. He can tolerate a poor shooting game. Those things happen, he said. But there wasn’t an excuse for the effort. The Suns led 13-9 after Ulis’ 13-foot floater in the lane, then the Pelicans began their offensive onslaught. New Orleans scored on seven consecutive possessions in a 16-2 run to go on top 25-15 on Cousins’ driving finger-roll layup with 3:17 left in the first quarter. That run reached 33-10 when Miller sank a 3 to make it 42-23 with 8:46 left in the half. The Pelicans outscored the Suns 30-19 the rest of the half. New Orleans led by as many as 36 in the third quarter. For the first time in an NBA game in more than two years, neither team made a 3-pointer in the one half of a game. The Pelicans were 0 for 12 in the second half, the Suns 0 for 7. The last time two teams went without a 3 in an entire half came when Orlando played at Washington on Feb. 9, 2015. Pelicans: New Orleans won three of four against the Suns last season. Two went to into OT, a win for each team. … Pelicans matched their season best with their third straight win. Suns: Suns started a ”twin tower” lineup of Greg Monroe and Tyson Chandler to try to combat the inside game of Cousins and Davis. … Phoenix ended a stretch where nine of 10 games were at home. Suns were 2-7 in those home contests. Pelicans: At Golden State on Sunday night. 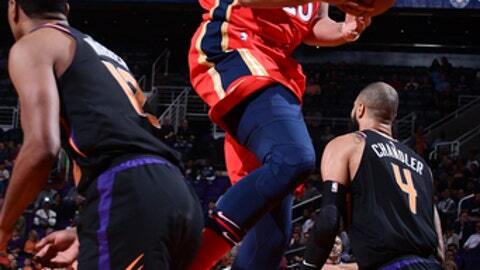 Suns: Phoenix opens a six-game trip Sunday at Minnesota.